The deer snuck in again last night and ate some swiss chard, which Anna says was a little buggy, so no big loss there. I managed to get another stretch of 5 foot high chicken wire up. It's starting to feel more like a perimeter with this latest barrier. Sounds like I need to make a trip up there this winter and actually take a deer or two rather than just watching her limp up the hill. She was wounded, I felt sorry for her. ...someone better with a gun than me to put some of these marauders in the freezer. I read in a homesteading book that if you put the fence up b4 you build the garden, the deer will leave it alone. That's going to be our first strategy. May you lose no more crops to the critters! That book is totally right. Deer change their eating patterns twice a year, and if you keep them out during those critical changeovers, you'll be safe for at least six months. The problem was that a deer crept past our defenses during the summer changeover, which means we ended up with a duo who know the garden is tasty. If only I'd been able to kill those two during our kill permit period, I think we would have been safe again! Instead, we'll just keep scurrying around until we block them out. 5 feet is no where near tall enough to completely keep them out. We've got a buddy who raises red deer for meat (basically a european elk) and he had to install 10 ft fences with a slight slant inward. Ive personally seen whitetail deer stand next to a 5-6' fence, then jump & clear it from just standing, no running start. They are crafty creatures no doubt about it. But the fence will deter them, as they often take the path of least resistance. Have you tried using predator smells by chance? I read somewhere that using fox/coyote urine and sprinkling it around makes them think there is predators in the area and they are less likely to stay around. A thought maybe. That and practice your target shooting, then enjoy the venision! We actually just used up the last of last years venison by making it into andouille, italian, bratwursts, salami, and pepperoni sausages. We don't expect the five foot fence to be a hard barrier, just a deterrent blocking off their favorite path. 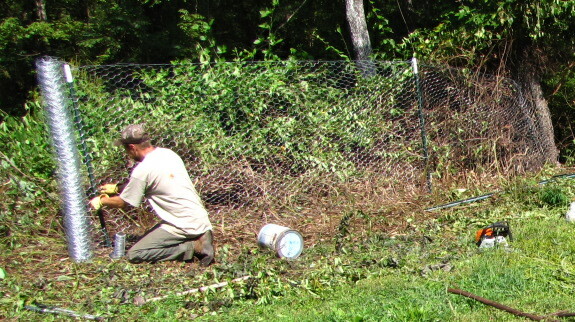 The idea is to come back in this winter when we have more time and turn that area into a chicken pasture --- the double-walled moats tend to be extremely effective at keeping deer out. We haven't bought the pricey predator scents because every other scent-based deterrent we've tried has had no effect. Actually, I take that back --- I think Mark's mom bought us some a few years ago, but they did nothing. The efficacy of various deterrents declines drastically when deer populations get as high as ours are. Unfortunately, we missed our kill permit window. I was out in the woods for about 20 hours (and exhausted myself since I was keeping the garden going to) to no avail. At the moment, it seems more time effective to plug away at making chicken moats than to invest more time in hunting. Thanks for the heads up on this....it's the first I've seen of such a thing. That does seem like an intriguing product and 60 dollars seems reasonable if it does the job, but I'm wondering just how high the voltage can be with only AA batteries. I think one might be better off getting a regular electric fence charger and making your own zapper, but then it would not be wireless and it might be too unsightly to some neighbors who care about those things. Of course I'd be glad to give it a WaldenEffect evaluation if said company was interested in sending us a complimentary one for us to try out and report the results to the web.....heck if it worked I'd probably buy a few to give those pesky swiss chard snackers their long awaited electrified comeuppance. I think this is worth trying, you get 3 units for $60 plus free shipping. The voltage is stepped up to several thousand volts (I'm guessing)through the miracle of solid state electronics and only uses significant power when it delivers the shock. Because they associate the shock with the area one jolt is enough to deter them,and you could also move them from one area to another to increase effectiveness. I do agree that replacing the scent every month can be expensive but perhaps you can find a way to get around this by placing them near something they like to eat. Keith --- Thanks for dropping by! I got your email about reviewing your product and we're excited to give it a try. We'll be sure to post when we see how it stands up to our severe deer pressure.